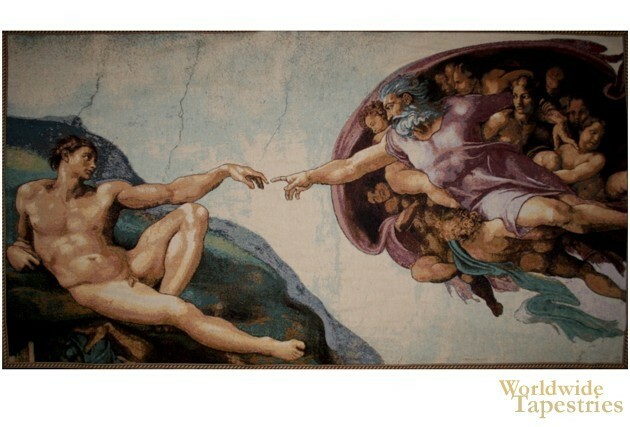 The Creation II - Michelangelo Italian wall tapestry is based on the famous Sistine chapel painting by Michelangelo from 1512. The Sistine Chapel in Vatican city was restored in 1477 and the frescos in it are some of the most famous from the Renaissance period. Here in this Renaissance masterpiece Creation by Michelangelo, we see Adam, the first man, made by God in his own image. The scene shows God breathing life into man with their fingers almost touching to symbolise the passing of life from God to man in the creation process, a moment of rare humanity of God when it comes to his rendition in Renaissance art. The fresco is part of a large collection of works in the Sistine Chapel famous for its wall frescos including this part of the ceiling masterpiece. This Renaissance tapestry Creation by Michelangelo is backed with a lining and a tunnel for easy hanging. Note: tapestry rods and tassels, where pictured, are not included in the price. Dimensions: W 24" x H 13"